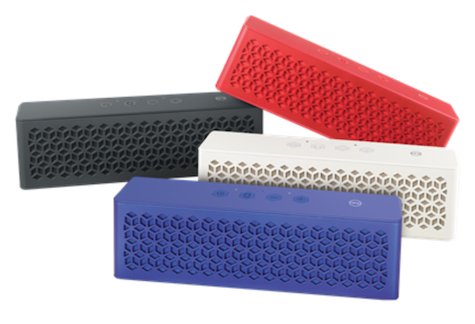 Creative’s new Muvo Mini go-anywhere speaker is the best new audio product MyMac has reviewed so far this year. It looks good, sounds great, has decent Bluetooth wireless range, and is water resistant. You can take a shower with Muvo, bring it when you go camping, and use it everywhere you want full spectrum personal audio. The low price is remarkable, and four colors are available. Four squishy rubber buttons on the top enable power on/off, volume up/down, and Bluetooth connectivity. A pleasant female voice alerts you when power and Bluetooth are on. A recessed and rubber-protected flap on the rear covers the two ports for micro USB charging and AUX input. The outer shell of the unit has a pleasant grippy feeling, and the front grille is attractive. I’ve been demonstrating Muvo Mini in all my recent iPad and iPhone classes and workshops, and people are impressed. I do side by side comparisons with other Bluetooth speakers, without first mentioning the prices, and the combination of best audio and best price consistently places this little gem in first position. The latest version of Bluetooth allows for sonic delivery equal to AUX cable physical connections. I keep Muvo Mini at full volume, and adjust listening levels from my iPhone and iPad. At top volume there is no distortion, and it is loud! Treble and midrange are outstanding, and bass is much better than you would expect from such a small and lightweight system. You will definitely get in trouble with the other people in your house and apartment, and your neighbors too if they are in close range, when Muvo Mini is playing at full blast. You can party and boogie for hours on a single charge of the built-in battery. At maximum level you will rock your socks off even in a large room, and at quiet level you can study or put your kids to sleep. There is no boom to the low end, and the high end is crisp and accurate. Audio conversations using Muvo Mini as a speakerphone sound excellent, although its built in microphone delivers unpredictable voice quality ranging from clear to muddy at the other end of the call. This is not a major drawback, because the speaker’s output is so good. The company rep explains: For voice calls over mobile or landline networks, the quality of the network will affect sound quality. Our Muvo Mini speaker is water resistant, and water in the speaker will affect audio quality slightly. The best audio will be experienced when your speaker is perfectly dry. The clever people at Creative Labs have done it again. Muvo Mini is outstanding and Nemo gives this speaker my highest recommendation. Our outdoor swimming season is still a month away here in southern Arizona, and I can’t wait to use this speaker for the soundtracks to my pool parties. Personal recommendation, with MyMac Review Rating of 9 out of 10. Must confess its portability, attracted my attention very much.